Tacrolimus has become an important cornerstone in the prevention of rejection after kidney transplantation. However, its use has been complicated by several side effects, including chronic allograft nephropathy, diabetes mellitus, arterial hypertension, and neurotoxicity. Tacrolimus-induced neutropenia is a less recognized, but potentially harmful complication. Three patients with severe neutropenia developing within 3 months after kidney transplantation are described. After having excluded other well known causes, tacrolimus was considered the most probable culprit. Definitive proof of this hypothesis was obtained by discontinuation of tacrolimus and switching to cyclosporine, which led to recovery of white blood cell count in all three patients. Tacrolimus is part of current immunosuppressive protocols after kidney transplantation. Other than its known side effects, little information is available about potentially myelosuppressive properties. Here we present three examples of tacrolimus-induced neutropenia and summarize potential hypotheses. A 63-year-old man with end-stage renal failure due to sarcoidosis underwent a deceased-donor renal transplantation in 2007. At the time of transplantation, peripheral blood count was normal. No induction therapy was given. Seventy-six days after transplantation he developed leucopenia (1600/μl) with neutropenia (1200/μl). Hemoglobin and platelet count were normal, whereas the renal function was stable. Immunosuppressive therapy consisted of steroids, mycophenolate mofetil (MMF), and tacrolimus. Potentially leucopenia-inducing medications were discontinued or tapered (Figure 1A). Viral infections including cytomegalovirus, Epstein–Barr virus, parvovirus B19, and toxoplasma were excluded. Bone marrow examination revealed no abnormalities, in particular no dysplastic changes, maturation stop, or arguments for malignant invasion were found. Treatment with granulocyte colony-stimulating factor (G-CSF; filgrastim) was initiated (for 5 days) on day 83 to enhance myeloid differentiation and to shorten the neutropenic period. Shortly after starting G-CSF therapy, recuperation of the neutrophil count was observed. However, neutropenia relapsed after 129 days (day 219). Omeprazole and MMF, both already reduced in dose, were stopped completely (day 220), but neutropenia persisted. Eventually, after having excluded other causes and despite a temporary effect of another four administrations of G-CSF, tacrolimus was considered to be the causative factor and was replaced by cyclosporine (day 351). One month later white blood count normalized (2700/μl) and remained stable until the last follow-up 24 months after conversion. Interestingly, MMF was restarted after 8 months, without negative effect on the white blood cell count. Therapeutic interventions in (A) patient 1. Therapeutic interventions in (B) patient 2. Therapeutic interventions in (C) patient 3. A 58-year-old woman, diagnosed with pauci-immune glomerulonephritis underwent a deceased-donor transplantation in 2007. No induction therapy was provided. Eighty days after transplantation biochemistry revealed leucopenia (1800/μl) with neutropenia (500/μl) without other abnormalities in the peripheral blood count. Immunosuppressive therapy included steroids, MMF, and tacrolimus. Because virological screening was negative, medication-induced leucopenia was suspected, leading to discontinuation or tapering of all culprit medications (Figure 1B). Bone marrow examination was performed, showing no arguments for central myeloid differentiation problems, underlying myelodysplastic syndrome, or malignant invasion. Although repeated treatment with G-CSF (day 81 to 86 daily, day 207 to 212 daily, and day 255 to 284 weekly) was associated with recovery of the white cell counts, relapse occurred whenever G-CSF therapy was interrupted. Eventually tacrolimus was replaced by cyclosporine. The white blood cell count normalized and remained stable until the last follow-up 27 months after initiation of cyclosporine and despite reintroduction of MMF. A 56-year-old man developed isolated leucopenia with neutropenia 85 days after deceased-donor kidney transplantation for IgA-glomerulonephritis. Immunosuppressive therapy consisted of steroids, MMF, and tacrolimus without induction treatment. 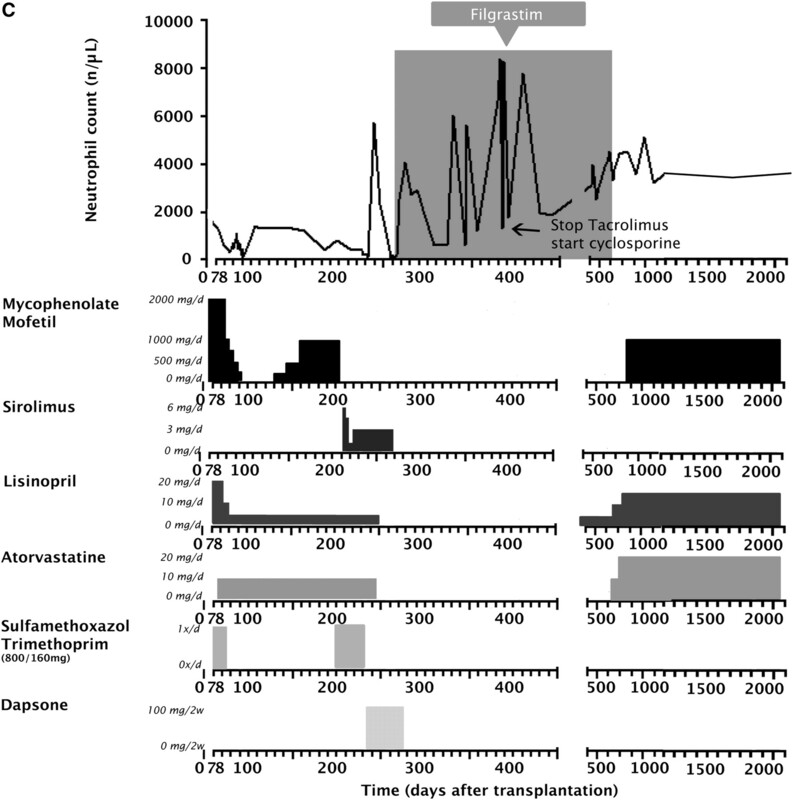 After having excluded viral infections and bone marrow pathology by blood and marrow investigation, medications known to cause leucopenia were immediately stopped or tapered (Figure 1C). Treatment with G-CSF was initiated, leading to a rapid recuperation of the white blood count. However, leucopenia relapsed every time G-CSF therapy was interrupted (G-CSF day 289 to 317 twice weekly, day 317 to 336 weekly, day 336 to 489 twice weekly, day 489 to 538 weekly, day 358 to 566 twice weekly, day 566 to 629 monthly). Eventually tacrolimus was replaced by cyclosporine. The white blood count normalized and remained stable, even after reintroduction of MMF, until the last follow-up 58 months after conversion. Table 1 describes the main neutropenia-related characteristics of all three patients. Cytopenias including neutropenia are frequently observed and potentially life-threatening complications in renal transplant recipients. The incidence of leucopenia and neutropenia in kidney transplant recipients ranges from 10% to 55.5% and from 4.9% to 37.5%, respectively (1). Etiology is often multifactorial and includes medication, infection, and bone marrow invasion by malignant cells. In a recent retrospective study in kidney recipients, the incidence of neutropenia in the first year after transplantation was 28% and was significantly associated with MMF-tacrolimus combination therapy (1). Medication-induced myelosuppression can be caused by numerous agents, including immunosuppressive and anti-infectious drugs. Because transplant populations are vulnerable to rejection and infectious complications, these agents may contribute to the high incidence of transplantation-related neutropenia. The most important drugs responsible for neutropenia are the antimetabolites azathioprine and MMF and the antiviral agents aciclovir, ganciclovir, and valganciclovir. Ideally diagnosis should be made by a single test showing a clear relation between myelosuppresion and a specific agent. Unfortunately in practice no such test exists in the case of medication-induced neutropenia, making the diagnosis mostly tentative by excluding other potential causes and by discontinuing the suspected medication, which led to regression or improvement of neutropenia. Although structurally unrelated to cyclosporine, tacrolimus' mechanism of action is similar, with inhibition of calcineurin and subsequent of IL-2 production being the common pathway. They both interfere with transcription of early T cell activation genes, which may also be important in nonlymphoid hematopoiesis (2). However, the immunosuppressive activity of tacrolimus seems to be stronger compared with cyclosporine, leading to improved kidney graft survival and prevention of rejection at 1 year (3). Although the association between tacrolimus and myelosuppression, in particular leucopenia, has been suspected for a long time, the exact mechanisms have not been elucidated yet (4). However, multiple hypotheses have been proposed and examined during the last few years. Analogous to other medication, it has been proposed that tacrolimus could induce a maturation stop in myeloid precursor cells. However, this hypothesis was rejected by in vitro experiments (5,6) suggesting that direct inhibition of myeloid cells is not likely to be mechanism of action of tacrolimus-induced leucopenia, although in vivo effects may be different. In our patients bone marrow examination showed no evidence for maturation arrest in myeloid lineage cells. The production of cytokines by lymphocytes or monocytes inhibiting hematopoiesis and inducing apoptosis may be another mechanism responsible for tacrolimus-induced neutropenia. By acting on these mononuclear accessory cells, tacrolimus might indirectly be able to alter the balance between neutrophil death and survival. However, in the experiments of Hirao et al., addition of antibodies against these cytokines caused no differences in enhancement of myeloid progenitor cell colony forming units, making this hypothesis less likely (5). 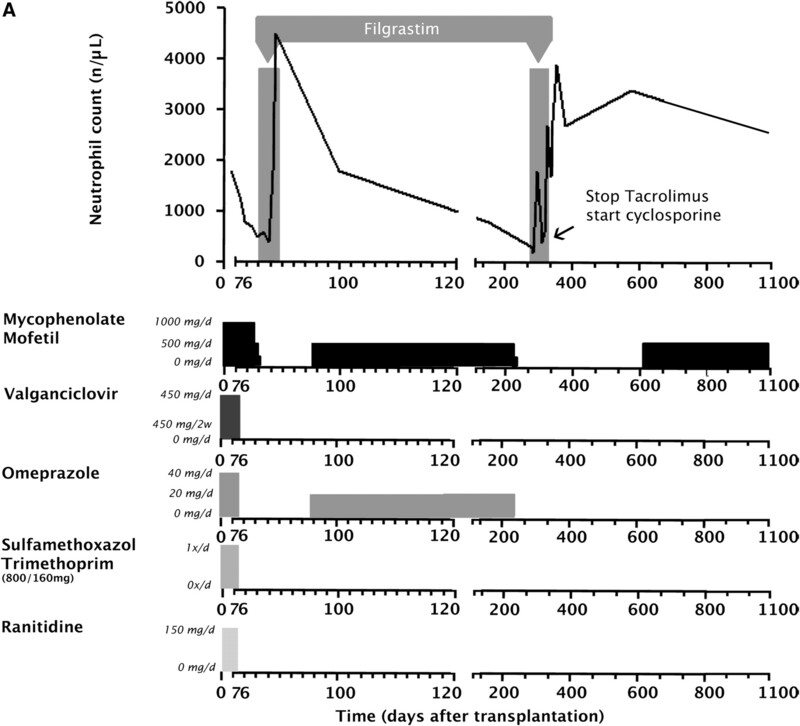 Tacrolimus increases mycophenolic acid (MPA) bioavailability by inhibiting MPA glucuronidation. It has been shown that kidney recipients receiving MPA in combination with cyclosporine have lower MPA plasma concentrations compared with recipients receiving MMF in combination with tacrolimus (7). In this way tacrolimus-induced neutropenia may be just the enhancement of the well known myelosuppressive effect of MPA, which may be less marked with cyclosporine. This hypothesis was supported by the findings of a study in which a higher prevalence of side effects of MMF (leucopenia, anemia, and diarrhea) was observed in patients on tacrolimus and an MMF dose of 2 g (8). However, because neutropenia persisted even after discontinuing MMF in our patients, this hypothesis can only partially explain the occurrence of leucopenia. Analogous to the demonstration of autoantibodies in many autoimmune disorders, a potential explanation for the myelosuppressive effects of tacrolimus may be the formation of autoantibodies after drug exposure. Although no such antibodies have been described with tacrolimus, this does not exclude this hypothesis because, for example, in more than half of the patients with immune thrombocytopenia no autoantibody can be demonstrated (9). However, taking into consideration that tacrolimus is a very potent drug in the treatment of many immune disorders, we did not find evidence supporting this hypothesis. It is clear that currently the precise mechanism of tacrolimus-induced neutropenia remains uncertain. In most patients concomitant factors make it impossible to determine the exact role of tacrolimus. However, our examples make the contribution of tacrolimus very likely because not only were other causes were excluded but, most importantly, neutropenia completely resolved after conversion from tacrolimus to cyclosporine. Although G-CSF is an effective treatment of patients with medication-induced neutropenia, it only has additional value by decreasing duration of neutropenia, antibiotic use, and length of hospital stay (10). However, definite resolution of the neutropenia can only be obtained by discontinuation of the drug, as clearly illustrated in our examples. One of the difficulties in investigating the effect of tacrolimus on myeloid cells is treatment with concomitant agents and the susceptibility of transplant recipients to infections and malignancies, especially lymphoproliferative disorders, which can all cause myelosuppression. Here we present three patients with severe neutropenia. In all patients, neutropenia occurred in the first 3 months after transplantation. After excluding medication-, viral- and malignancy-related neutropenia, we switched tacrolimus to cyclosporine, which led to resolution of neutropenia. Although the exact mechanisms leading to neutropenia in patients on tacrolimus have not been elucidated, these examples demonstrate that the association exists and can only be resolved by replacing immunosuppressive treatment. We thank Mr. Albert Herelixka for his efforts in preparing the figures.